THERE is A RECURRENT ASPECT OF GAUGUIN'S ART - and this calm canvas is an example of it - which is inevitably called decorative. Sometimes his designs, rhythmic and slow, suggest the narrow, billowed-out relief space of a sculptured frieze. For this canvas, richer in color harmony, more fused in tone, tapestry is perhaps the closer parallel. The composition is filled by the tall figures, which almost touch its borders, by the trees, which go beyond them, and the horizontal bands of ground and sky, so that every spot is as rich and articulated as any other. The color areas, whether of bodies or pareos, whether of tree trunks or leaves, or earth or light-filled golden air, are large and well defined. But they have been softened to give them a rich and sensuous texture, as if by some enveloping atmosphere, or some heavy woven material that affects all surfaces alike and removes them into the unreality of an ideal, distant, and silent land. The strong repeated verticals of the figures are lightened just enough by their bodies' grace so that they have the long rhythms of the ground and hills, and the seated figures, whose smaller scale gives size to the whole, repeat the shorter, rounder curves of the plant in the foreground and the branches and leaves above. The idylls of Puvis de Chavannes have been evoked as comparisons to this picture ("Puvis overwhelms me with his talent," wrote Gauguin, and he put a copy of Puvis' Hope into one of his last paintings). And to be sure, there is the nostalgia for a simpler existence in both artists. 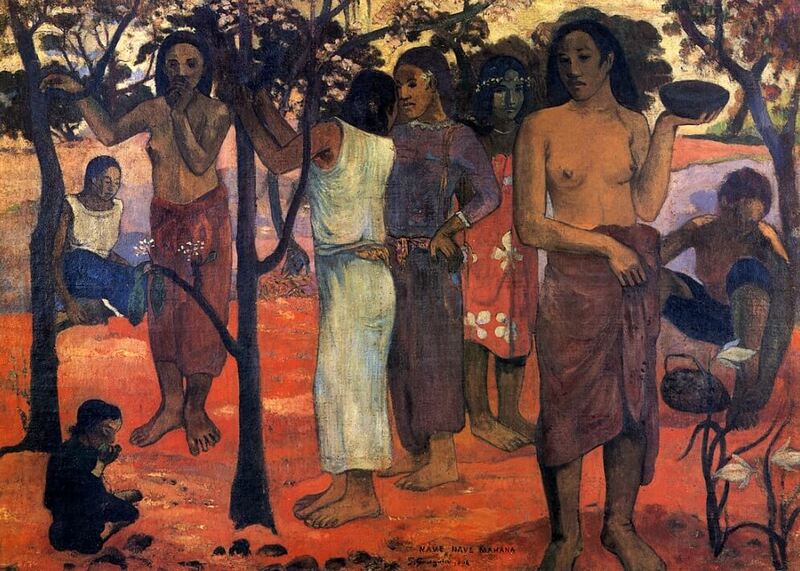 But Puvis views his Classic landscapes through a telescope from some distant Olympus, while Gauguin brings his tropical version close and warm before us. Here there is no mystery, no exoticism, no irony. This is simply Anacreon in native dress: the Classic tradition carried halfway round the world.